One of our most asked about new line of greenhouse irrigation equipment is our Outdoor Booms. We currently offer two different style booms: Sky-Rail and Ground-Rail Booms. Both booms are custom built to your needed dimensions and affordably offer the same great features as indoor booms. 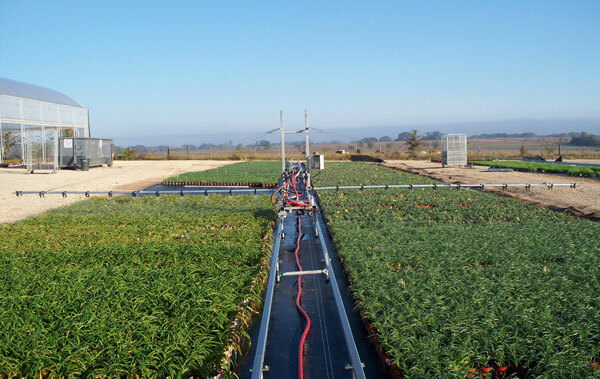 The Sky-Rail Boom is built on the same basic design principles as our Rail Boom greenhouse irrigation equipment, except for a few minor tweaks. This boom rides on a center row of posts and a stabilizing cross beam which looks like a ‘T’. This not only eliminates the need for unnecessary steel and construction, it also maximizes growing space. 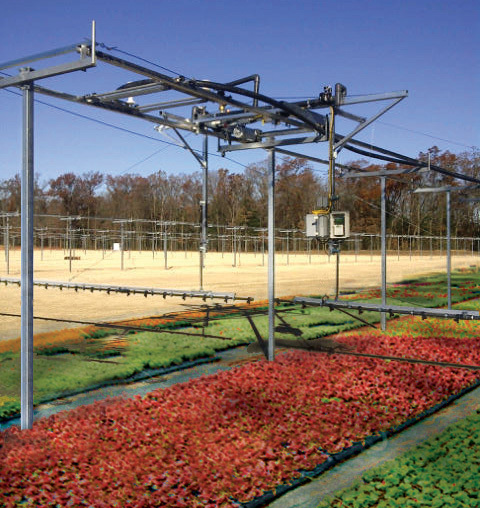 Similar to our other booms and other greenhouse irrigation equipment it can be programmed with Cherry Creek controllers to reduce labor costs and ensure even water distribution. Because our controllers are built with the elements in mind, they are factory ready to ship. Our Ground Rail Boom is great for large acres of monocrop farming. Its simplistic design delivers affordability, reliability and ease-of-use. Due to its intended design as greenhouse irrigation equipment, very few moving parts or extra steel is needed. It has a low profile to increase stability and overall it’s one of the most cost-effective solutions in irrigation technology that you can install.